This is my first post here, i found this group today and i'm really excited to be here and read all those amazing people's stories. I want to implant my first device, not sure what it will be (btw you can propose something), but i got one problem. I travel very often, sometimes by plane and i'm not sure if it's okay to take on the plane, if it won't be located at the gates. Fireflies emit radiation, magnets emit magnetic field - sounds not very OK for airport staff. Do You have guys any experience with that? Any reccomendation? Or which implants can stay invisible during this proccess? I have an xNT tag and it's never been detected by airport security. I travel fairly frequently and I've gone through my fair share of metal detectors and body scanners. firefiles hardly radiate outside the glass containment. There are test results regarding this on the forum (somewhere). IIR it's hardly different from regular background radiation. fun fact: i've been told that smuggling enough plutonium around to build toys of destruction won't set off any radiation detectors either (too stable), but bananas sometimes do. Magnets shouldn't be much of a big deal, static fields are of no real concern. RFID tags generally won't pop up as they are passive device with a tiny amount of core material. 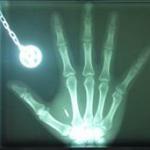 I got this week 2 new implants in the UK and on Friday I returned to Germany - no problems - I have 5 RFID Chips and 1 Magnet.